The Ad Contrarian: What Do Clients Want? 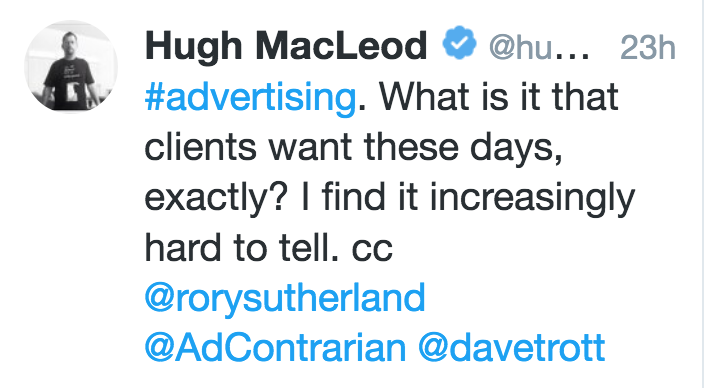 A few days ago the great Hugh McLeod (of Hughcards fame) posed the following question on Twitter: "What is it that clients want these days, exactly? I find it increasingly hard to tell." As soon as I saw this I started to type. Without thinking I wrote, "They want the fruits of advertising without the cost of advertising." It was one of those instances where something writes itself without me. And as I was writing I thought, yeah, that's what they want. That's what the social media and brand content fantasies are all about. They're about trying to get something for nothing. And like all schemes to get something for nothing, they are doomed to fail. Ten years ago we were fed a delusion. The delusion was that consumers loved brands and wanted to "join the conversation" about brands, and read about them, and share their enthusiasms for them with their friends. It was an infantile delusion but it was powerful. It's ten years later. It's time to wake up.